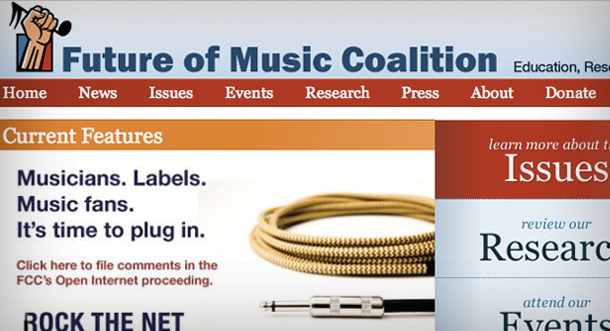 Canary needed to re-architect Future of Music Coalition’s (FMC) established site with massive amounts of content and bring the best of that content to light. The site needed to feature research, congressional testimonials, issue-focused articles, and an annual policy summit that invites hundreds of people to convene in Washington. We created a site architecture and design and built a system that lets FMC publish as often as they like and efficiently promote the best of their content on the home page and on each section landing page. The site also features a robust Constituent Relationship Management (CRM) system called CiviCRM that integrates closely with Drupal and lets FMC capture and manage highly detailed information about their audience and event participants. Future of Music Coalition is a national nonprofit organization that works to ensure a diverse musical culture where artists flourish, are compensated fairly for their work, and where fans can find the music they want. The site has a broad and diverse audience, ranging from independent and established musicians from all genres in every stage of their career to music industry professionals, to lawmakers in Washington.